The world is shocked and outraged as news spreads of the inhumane fate young giraffe Marius endured in the hands of human keepers at Copenhagen Zoo, Denmark. The web is full of extremely graphic images and videos of the slaughtering and autopsy of the 18-moths-old creature, whose remains were fed to lions, all under public eyes, including those of children of all ages. Marius was the youngest male of a group of seven giraffes at the zoo, and he was perfectly healthy. The zoo explained he had to be put down because of lack of space and strict regulation to avoid inbreeding, for the overall well being of the giraffe population. Against all this scientific reasoning though, there are several hard facts that could have saved the giraffe's life. However, they went completely unacknowledged by the zoo management. 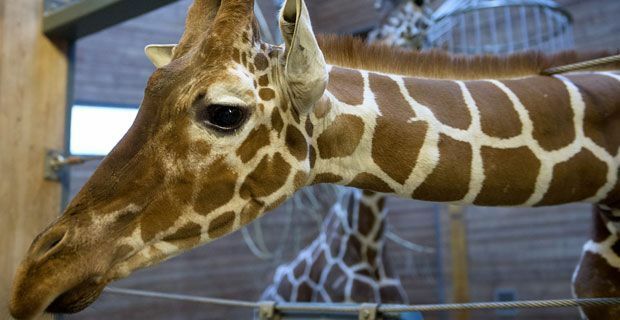 A British zoo had offered to give a new home to the young giraffe, also starting an online petition to save him – but the over 33.000 signature gathered apparently weren't enough. There were also privates who offered to take Marius in their care, for example and American billionaire who pledged the zoo to let the giraffe live in his home gardens in Beverly Hills. His offer was turned down as well, with the zoo direction 'not interested in selling'. In front of these offers, no rational being could possibly still consider the killing of a perfectly healthy young giraffe as something 'necessary'. However, this is exactly the term that Copenhagen Zoo keeps using in order to defend its action from flowing criticism. More precisely, the zoo explains it followed the recommendation of the European Association of Zoos and Aquaria (EAZA), a 347-members-strong, Amsterdam-based organization which aims at preserving global biodiversity and achieving the highest standards of care and breeding for animals. In practical terms though, this also meant that Marius was not a "genetically valuable giraffe", therefore had to be put down. The butchering went ahead despite pleas from animal rights activists, the intensity of which left stuff at Copenhagen zoo 'surprised'. Animal Rights Sweden said Marius' case simply reveals what is common practice in all zoos. The statement also highlights the fact that once the cute little animals, magnets for visitors, grow up they are not useful any more, unless for reproduction. In Britain Elisa Allen, spokeswoman for People for the Ethical Treatment of Animals (PETA), also said that Marius' case should serve as an eye-opener for all those who "still harbour the illusion that zoos serve any purpose beyond incarcerating intelligent animals for profit".